Handicrafts made of coconut shell and wood. These two materials: coconut and wood is widely available in accross Indonesia. This simple but elegant wooden bowl is possible to add name dropping such as "Guadalope" as seen on the photo of coco shell bowls below. 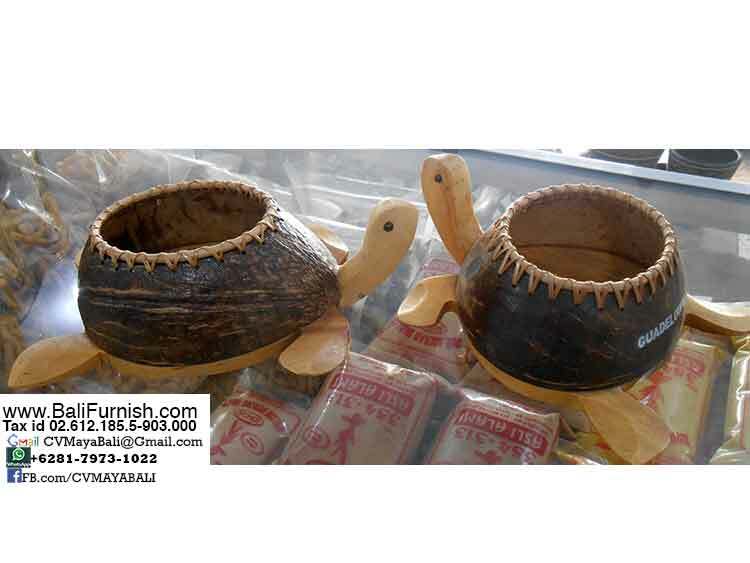 Other than turtle bowl made of coco shell, we have also many more handicrafts made of cocnut shell or coconut wood. 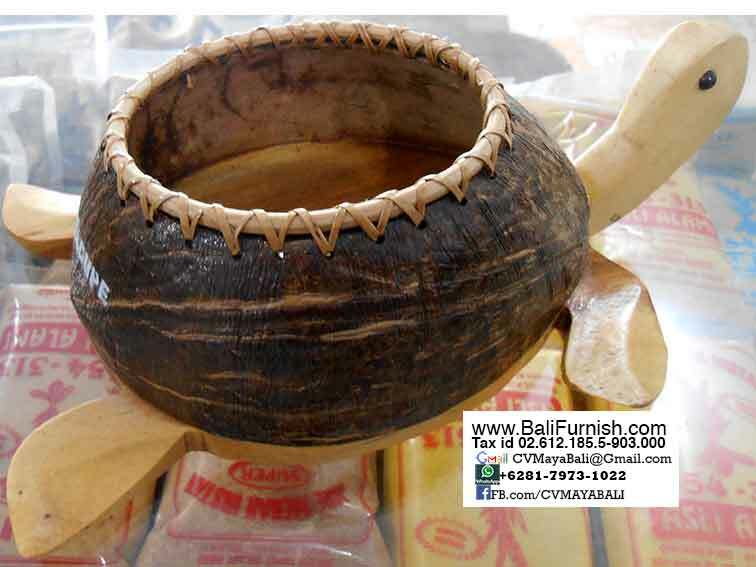 Please browse our catalog of coconut wood crafts from Bali Indonesia. You will find bowls, trays, plates, soap holders, coasters and placemats etc. All of them made of coconut wood. Please place your order for these arts and crafts weeks in advance. Coconut shell crafts made in Indonesia. Made of combination between coco shell and wood with little bit of rattan. Beautiful home crafts direct from Indonesia. Wood crafts and furniture from Bali Indonesia. Our company CV Maya Indonesia located in Bali and Java Indonesia. We're able to supply you with handicrafts and furniture made in Indonesia. Handicrafts home decorations ornaments and accessories made of natural materials such as wood stone rattan wicker coconut stick etc. Furniture made in Indonesia. Furniture for indoor and outdoor. Home living room garden patio and lawn. Teak root furniture factory. Table chairs, bench, cabinet or coffee table made of teak tree log. Teak root furniture from Java Indonesia. We're the No.1 source for teak root furniture. Natural furniture made of teak root. Bench lounger table chairs made of teak tree root wood. 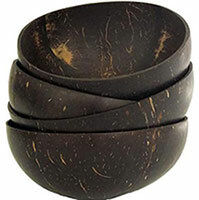 Coconut shell bowls from Indonesia. Direct from factory. Wholesale price. Ship worldwide. Contact us now. Email or WhatsApp. Our Handicrafts are handmade in Bali Indonesia by traditional Balinese craftsmen who been producing many kind of Bali crafts and other Bali homeware for many years. These arts and crafts are available in various colors not only color shown here. Please browse our catalog of boat wood home decors. Various wood crafts made of reclaimed wood from old wooden boats. Made in Indonesia.